Nice....lots of juice for a hot weather ! What a great technique!! Your mom comes up with some awesome cooking tricks! A home made sorbet is healthy as you know what you add in. If the watermelon is sweet then the syrup is not needed I think. So far I just eat fresh watermelon and juice only. Never had sorbet before. So did small kucing finish the sorbet since he says not sweet enough? Just eat like that, nice already leh? Cold though, don't eat too much - later cough! Old people always say that. Hehehehehehe!!!! Wah, I see also very refreshing.. I love watermelons too.. Once eaten, cannot stop one.. Sedappp.. Wah, mamarazzi so good ahh, make sorbet for you.. Nobody make for me la.. If I'm thirsty, I just make Ribena ice nia.. Or Milo ice nia.. Nobody buy watermelon, cut and blend into sorbet for me also la.. Sob sob.. But I bought ice cream moulds from Daiso, can put Milo inside or anything like yogurt+fruits, then can make popsicles.. Sedap jugak..
Good idea... very quenching especially on hot days! Sounds delicious on a hot summer day! George and I eat a piece of watermelon most every day during the summer... It's SO good ---and good for us since it is low in calories!!!!! wah wah wah!! Uncle SK saw the watermelon also drooling already.. it was so hot, and how nice if can wallop these big chunks of watermelon.. especially those that are just taken out from the fridge, bite and the juice "spurt" all over, surely very quenching and cooling and refreshing!!! very smart Mamarazzi!! 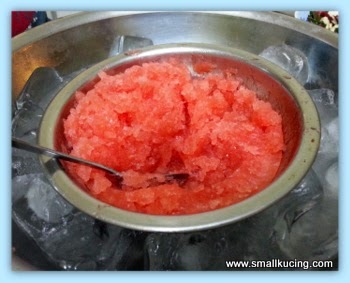 Uncle SK has never thought of making watermelon sorbet from that.. next time must follow Mamarazzi's instructions to make this simple watermelon sorbet.. but of course Uncle SK will tambah a bit of lemon juice and a dash of salt into the mixture, guess would be nicer and more refreshing hor?? hahaha!! served in a pot of ice cube somemore!! Mamarazi memang got idea lah.. and sure Small Kucing enjoyed it very much lah.. Uncle SK also agrees with Mamarazzi lah, homemade ones better cut down on sugar content, taste nice also being "kurang manis" mah.. 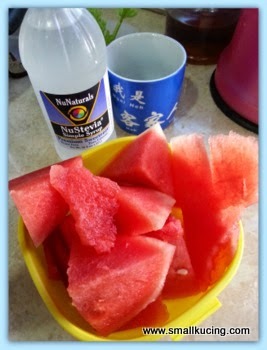 I'm wary now of watermelon after hearing, on 2 separate occasions, of chemicals sprayed and absorbed by them. Sigh. Was it watermelon seasons? I thought we have watermelons all year round. Gosh! I didn't know this and learn something new today! 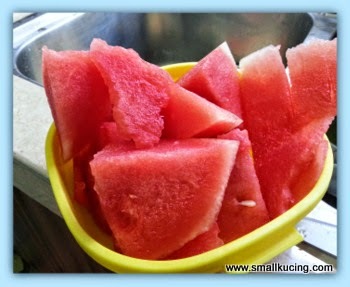 Water melon is the best fruit to cool me down when I feel heaty inside. Simple but looking at the outcome, I'm mesmerised. That watermelon is making me hungry. So refreshing and you know how much I love stevia.